Scott Dunn is the Senior Director of Content and Communications at the Arizona Office of Tourism. A former journalist and native of Tennessee, he has lived in Arizona for the past 12 years. If you mention the Salt River to folks in the Phoenix area, they invariably flash to images of sun-baked revelers atop tire tubes, canned beverages in hand, riding a lazy current in the general direction of Mesa. And, yes, that is one kind of Salt River experience. But there is another. Many miles upstream, above Roosevelt Dam, the Salt River curls through 2,000-foot-high granite walls in what is sometimes referred to as "Arizona's other Grand Canyon." And, if the conditions are right, there's no better place in America to go whitewater rafting in early spring. "When the snowmelt is good, there's really not anywhere else in the West where you can paddle this kind of water in March and April," says Lauren McCullough, our river guide, after steering our raft through a rapid called "Baptism." It's the first of more than a dozen rapids our boat encounters during a daylong guided trip of the Upper Salt Canyon. Lauren is part of a sandal-and-sunglass-clad army of river guides who migrate to the Salt River Wilderness from all over the country each March. They come because the Upper Salt is to river rats what Cactus League Spring Training is to pro baseball players: a clarion call, rippling out from the desert that the season is starting for the thing they love. As whitewater rivers go, the Upper Salt is a fickle beast. Its flow is dependent on snowmelt and runoff from the White Mountains, and mild winters are its kryptonite. But thanks to the heavy snowfall and late-winter rains that fell on eastern Arizona this year, Lauren says the paddling on the Upper Salt is as good as she's ever seen it, and she expects rafting season to extend through May. Optimum flow on the river is 2,000-3,000 cubic feet per second, and it's running at the upper end of that range for our trip. That means plenty of fast sections and big waves. "This next rapid is called 'Island Rapid,'" Lauren says as our raft bounces toward a big rock in the middle of the river. "Get your feet locked in and listen for my commands." About 52 miles of the Upper Salt River can be navigated by boat—but only if you have a permit and serious whitewater-paddling skills. Most of the rapids are of the Class III-IV variety on the International Scale of River Difficulty, and at low water, a few of them border on Class V.
Most people who raft the Upper Salt River do what we did: book a trip with an outfitter. Several seasonally set up shop near the junction of U.S. 60 and U.S. 77, between Globe and Show Low. 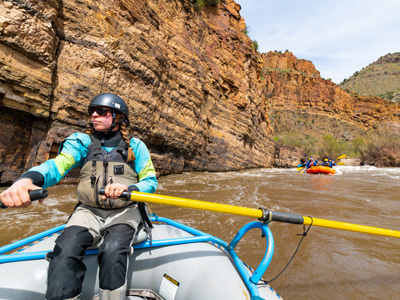 We're riding with Salt River Rafting, whose guides handle all the permitting and logistics, and provide essential gear such as a life jacket, helmet, wetsuit and neoprene shoes. I instantly appreciate the wetsuit as Lauren runs us through a rapid called "Wake Up" and cold water crashes over the nose of our boat and into my lap. Two truisms of rafting the Upper Salt: Every rapid is aptly named, and staying dry is not an option. Still, from the first rapid to the last, never once do I feel chilly or uncomfortable. On the contrary, warm sunshine plus cold water plus adrenaline adds up to the perfect spring cocktail. And the riverside lunch the guides prepare for us—chicken fajitas with an appetizer of chips and salsa—is downright indulgent. We eat it at picnic tables in the camp where the guides—more than 70 of them this season, Lauren says—make their home for 2-3 months. Despite the hard work and lack of creature comforts, the guides seem as happy as the guests—maybe even more so. "Camp can get a little crazy some nights, but it's pretty amazing to wake up to this every day," Lauren says, lifting her eyes to the rose-colored cliffs and wildflower-strewn slopes enveloping us. On the beach nearby, one of her fellow guides, a wildly bearded twentysomething from Georgia with pale blue eyes like river froth, is rallying the members of his raft. "Y'all know what George Washington told his troops before they crossed the Delaware?" he asks, barely leaving a beat before the punchline: "'Get in the boat!'" Some of the best rapids of the day come after lunch, including "Exhibition" and "Mescal Falls." The former is a long chain of splashy waves, while the latter—the grand finale of the trip—is a big, Class IV drop that soaks everyone in the boat. At the takeout, a few of us guests help the guides get the rafts off the water and onto a trailer. But the day is not done. Some rafters pile into a well-loved school bus for the ride back to our cars, while the rest of us climb into the back of a flatbed truck with open-air bench seats. We follow the narrow, rutted Apache Road 1, which parallels the river and crosses Cibecue Creek. The water in the creek is about two-feet high. Our driver shifts into low gear and powers through. It's a smooth run; nobody gets wet. All the while, Lauren gracefully clings to the side of the truck like a fireman, pointing out rapids we ran and roadside wildflowers—purple lupine, yellow Mexican poppy and (her favorite) golden-orange deervetch. The guide from Georgia tells another joke. It's not terribly funny, but everyone in the truck breaks into big smiles and laughter. After a carefree day on the river, we're an easy audience. Why go: Run the rapids in "Arizona's other Grand Canyon." Cost: About $90-$130, depending on the outfitter and whether you book a half-day or full-day trip. Multiday excursions with riverside camping are also available. Pro tip: Book a full-day trip—the lunch and extra rapids are worth it—and bring dry clothes to change into when you're off the river. BTW, speaking of tips, it's customary to tip your river guide 10-20% of the trip cost.